One of the unspoken mysteries of business and careers is the route to the C-Suite. Even organizations most committed to talent development offer vague feedback and guidance to managers. The result is that aspiring executives with real leadership potential flounder. At the same time, companies shortchange themselves when it comes to maximizing their management ranks. 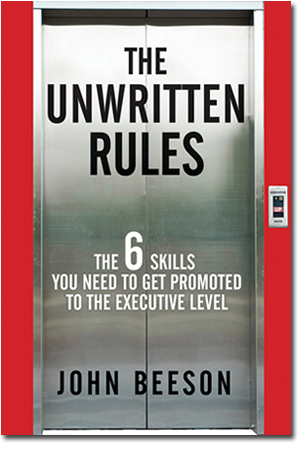 The Unwritten Rules decodes what it really takes, from a personal and career development perspective, for talented executives to make it to the upper echelons of leadership. Author John Beeson, a succession planning and top-talent expert engaged by leading corporations, lays out the often poorly-articulated criteria that companies actually use to decide who gets elevated and whose careers will stall. Far from just providing tips, The Unwritten Rules identifies and explores – with the help of detailed anecdotes from corporations – six "selection factors" one must display to move into and lead effectively at the executive level. The book also explains how to develop those capabilities, or work around them, if necessary. A practical and insightful book, The Unwritten Rules also uncovers the characteristics that prevent talented individuals from becoming serious top-management candidates, as well as those capabilities that – after all discussions are over – are most critical in decisions about who advances and who doesn’t. Drawing on extensive research and years of hands-on experience, Beeson shows aspiring executives how to demonstrate convincingly to senior-level decision makers that they have what it takes to succeed at the top. Filled with the stories of managers who successfully climbed up the executive ladder and others who struggled and failed to achieve their career goals, The Unwritten Rules provides the insight you need to sharpen the leadership capabilities that will truly maximize your chances of getting to the next level. For a look inside The Unwritten Rules, please visit Bloomberg BusinessWeek to read a special excerpt. Read Chapter Ten: "Navigating Career Dilemmas"